5PM is a crucial time for fitness, health and overall well-being. That's exactly the time when we commit the most food mistakes.Though we might have had a healthy, wholesome breakfast and lunch, we inevitably gorge on something junk as part of our evening snacks, mainly because of the lack of options. This becomes even more a reality if you tend to work out of an office. I asked myself - “If I were working out of an office location on a full time basis, what snacks would I carry to eat at 5PM?" Disclaimer - I’m neither a nutritionist nor a doctor. And the following recommendations are under the assumption that you don’t have any health ailments or allergies. And yeah, you are looking for overall wellness and not weight loss. Sundal is a South Indian lentil-based snack. You can use either Kabuli channa, brown channa, black eyed peas, horsegram or Bengal gram dal. Heat a pan, add a few drops of oil, splutter 1/4 tsp mustard, pinch of asafoetida, red chilli. Add cooked lentil, salt. Mix well for 2 min. Add a tbsp of grated coconut. Saute in medium flame for 2 min. When the coconut is sautéed, the Sundal stays good till evening. You’d need 2 stainless steel or glass boxes with airtight lids. Let’s avoid plastic as much as possible. And yes that means Tupperware too. In one of the boxes, take a salad of chopped cucumbers, tomatoes, capsicum, boiled corn and/or boiled sweet potato. 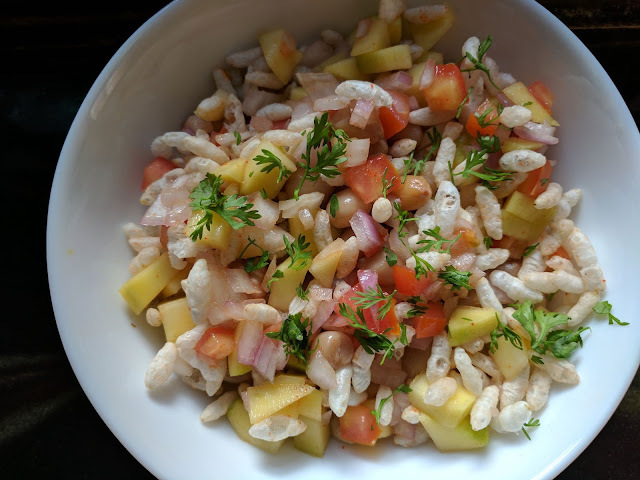 Make a quick dry-bhel, mixing the two boxes together. Add required salt and pepper. Adding salt to the veggies tend to release water and so by evening, the salad tends to become soggy. So I’d recommend you sprinkle salt just before eating. One of the perfect snacks to carry in a box. Can be made with methi greens, bottle gourd, carrot, radish or a mix of vegetables. Filling, wholesome and non-messy. Use jaggery instead of sugar. If you make with ghee, the laddoos stay good for 4-5 days. Get the two boxes again. Around 5 PM, add water to the organic poha and let it soak for 10 minutes. Once water is absorbed and poha has softened, add the jaggery+cardamom powder. Mix well and eat it. Filling and yum. I can eat idli for any meal of the day. Do try this option if you are a idli lover. Cut idli into bite-sized cubes. Toss it in chutney powder + sesame oil mixture. Pack it in a steel box. Try a variety of idlis using rice and/or millets. It is the only “packaged ready-to-eat food” I buy regularly from the market, because I’m too scared to make it at home (getting the right consistency of the jaggery syrup is the key here). Peanut chikkis (ID brand has recently launched chikkis too), sesame chikkis, rajgira/amaranth chikkis, flaxseed chikkis - so many options available to choose from. I’m referring to snacks like murukku/chaklis, ribbon pakoda, thattai/nippattu, chivda etc. Yes, I’m serious that these are healthy choices. Most of these snacks are made with either rice flour, gram flour and/or roasted gram flour. They can be made more nutritious by using millet flours like ragi flour, bajra flour etc. If we ensure they are fried in fresh oil (not reheated), they make a perfect snack. Since they are deep fried, you wouldn’t be able to eat more than a couple of pieces (or a handful of chivda). These are much better options when compared to a pack of say, Lays chips or the much expensive Pringles. My first choice would be homemade. If that’s not feasible, I’d buy such Indian snacks from a small-scale condiments store. I wouldn’t recommend any “energy bars” from the market as they are loaded with sugar and/or preservatives. And I wouldn’t recommend “bread” based snacks like sandwiches too, because of the fact that most store bought ones use maida (including whole wheat bread) and raising agents. If you have any other suggestions for snacks that are easy to carry and healthy, please share in the comments below.